The Emergency Manager is seeking City Council approval of a $350 million short term loan. This loan typifies how the banks who destroyed our neighborhoods with the illegal and fraudulent mortgage foreclosures, are now looting the city treasury with the collaboration of the Snyder/Orr emergency management. $250 million of the proceeds of the loan are to pay Bank of America and UBS termination fees on interest rates swaps. This is in addition to the over $250 million these banks have already netted on these swaps based on the city paying the banks hedging derivatives amounting to 6.3% interest on bonds where the actual interest on the bonds was only 0.5 to 1.0%. This new $350 million loan, which must be paid back in no longer than 3 years, is secured by a first lien of the city’s casino tax dollars, a second lien on income tax revenues and a lien on all other city assets worth more than $10 million if the other liens are insufficient. The bank being paid to service the loan is Barclays, which admitted to fraudulent conduct in the LIBOR scandal. Incredibly, the short term loan is tied to the LIBOR index. Bank of America and UBS are both clients of Jones Day, the Emergency Manager’s “former” employer and the so-called lawyers for the emergency manager in the bankruptcy. No wonder that rather than go after these banks, he is trying to award them this sweetheart deal. We don’t owe UBS or Bank of America one dime. 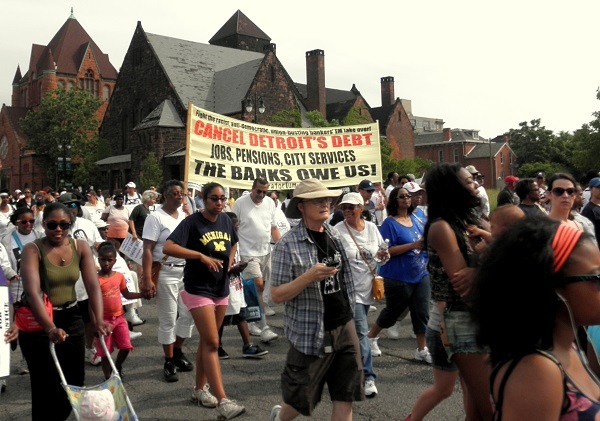 The banks owe the people of Detroit billions of dollars for the destruction they caused to our communities.